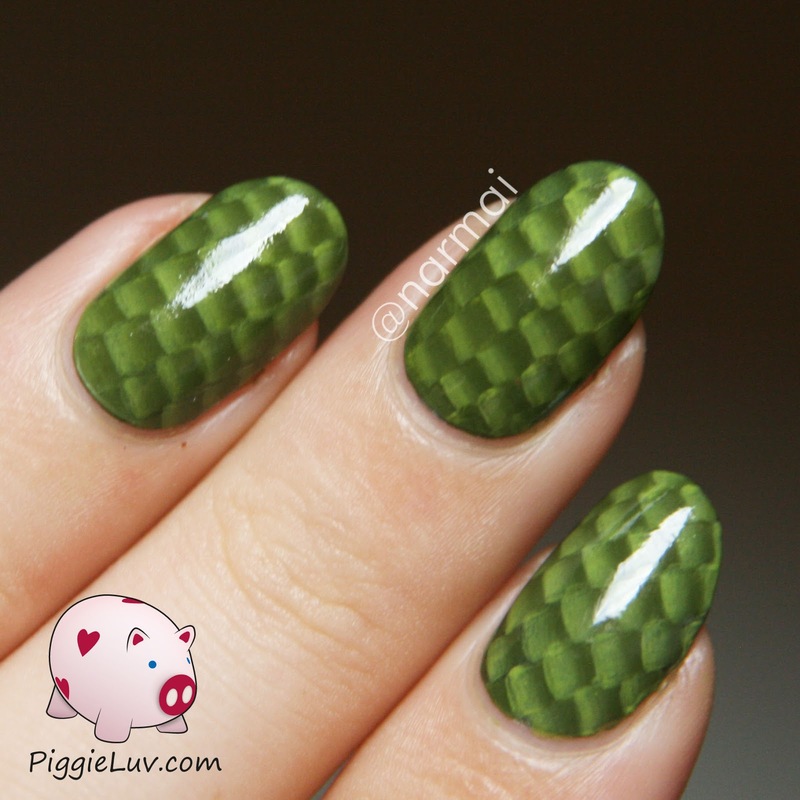 PiggieLuv: My 14 favorite nail art designs of 2014! 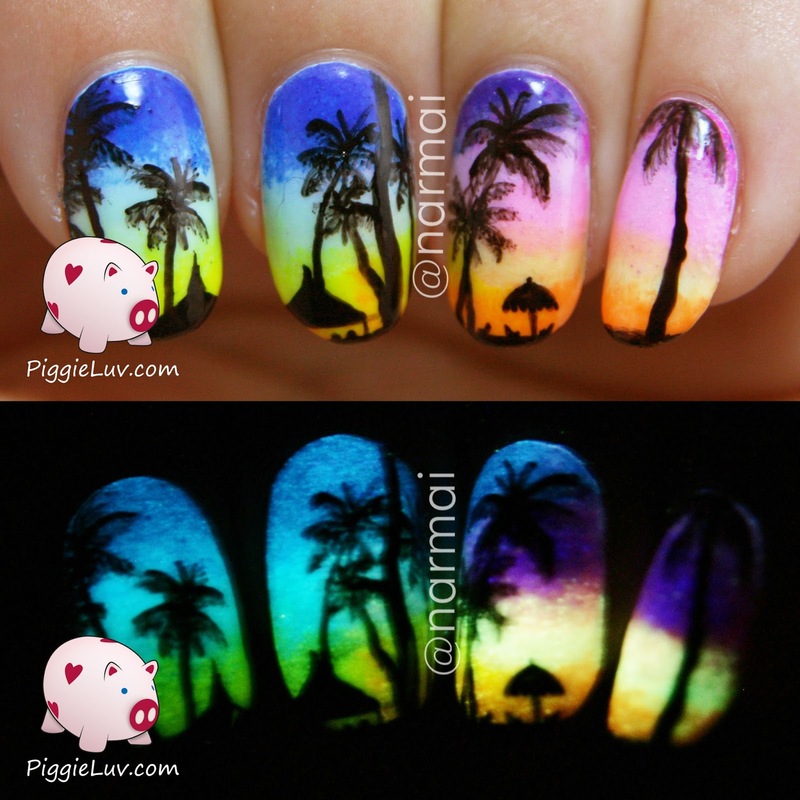 My 14 favorite nail art designs of 2014! Okay so after tomorrow, 2014 is officially HISTORY!!! This year marks my biggest development in nail art, I've never made as much progress as I have these past few months. 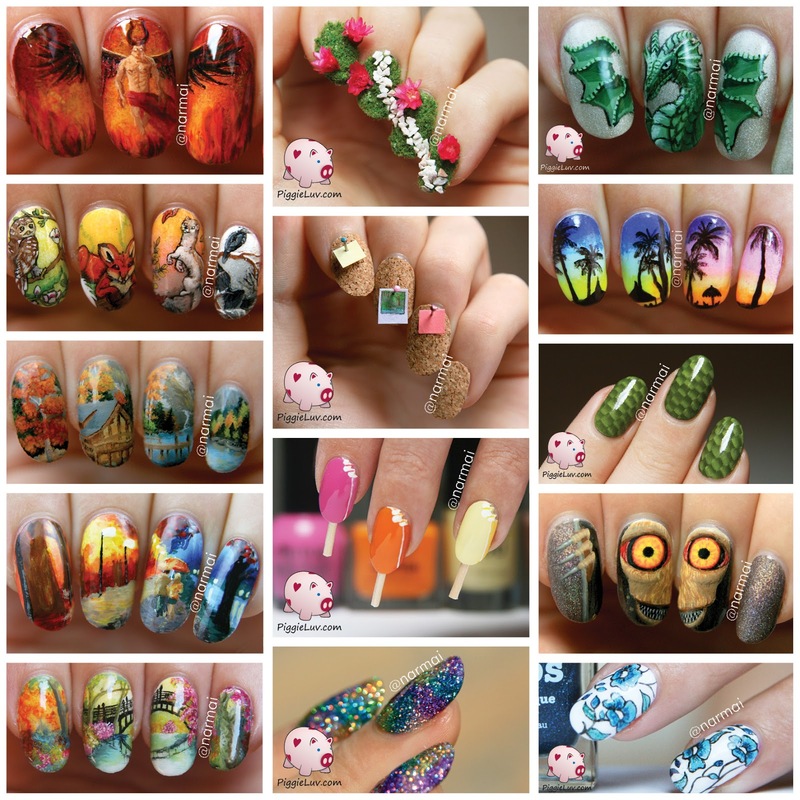 I've chosen my 14 favorite nail art designs of 2014, maybe your favorite is not in here so feel free to tell me! I just picked the ones that mean the most to me for a particular reason. Click to see them! I have a folder on my computer in which I save images that speak to me, that inspire me. I had this painting by Leonid Afremov saved in there for the longest time, afraid to recreate it. 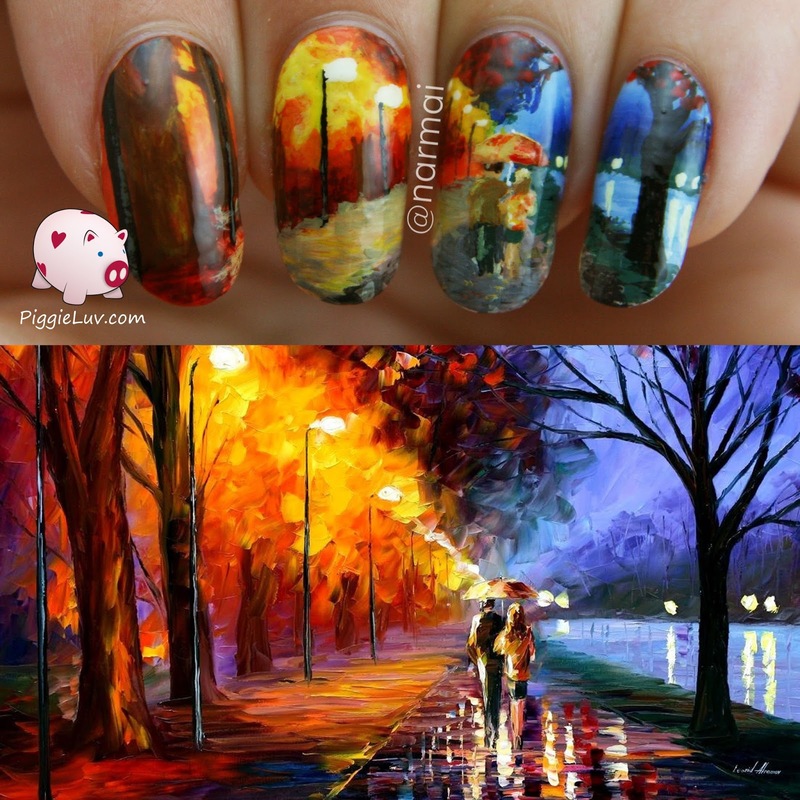 It was the first art recreation I did on my nails! 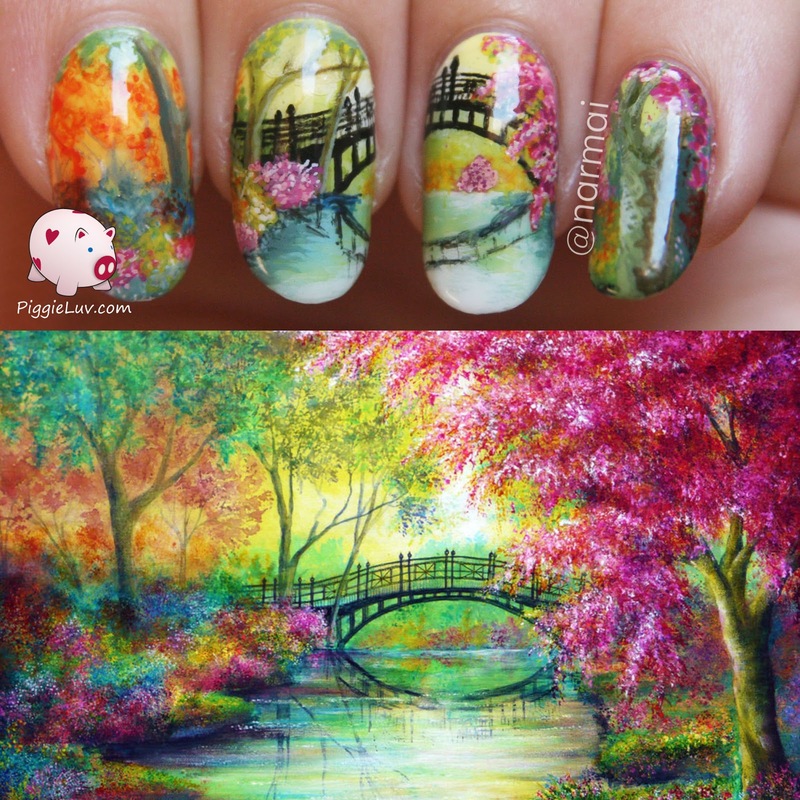 And then I found Ann Marie Bone. Her art is vivid, dreamy and just amazing, she has heaps and heaps of talent and vision and I love all of her paintings. My heart was drawn to this particular painting, called 'Dreams Of Elysium' and it cost me 7 freaking hours to recreate! As it happens, Ann's daughter Charlotte is in one of the nail Facebook groups I'm in, and she saw this and shared it with her mom! I'm honored and amazed that the original artist saw, liked and shared my recreation!!! Sparklies!!! I found a saying on the internet saying 'Don't Let Anyone Dull Your Sparkle' and it's exactly what I always try to preach to the nail world. I formed an idea in my head with a sparkly base and a greyish gradient on top of it etc etc. The base was SO sparkly that I had to take pictures of it on its own, and everybody loved it! This video tutorial went viral! Now this was just so convenient. 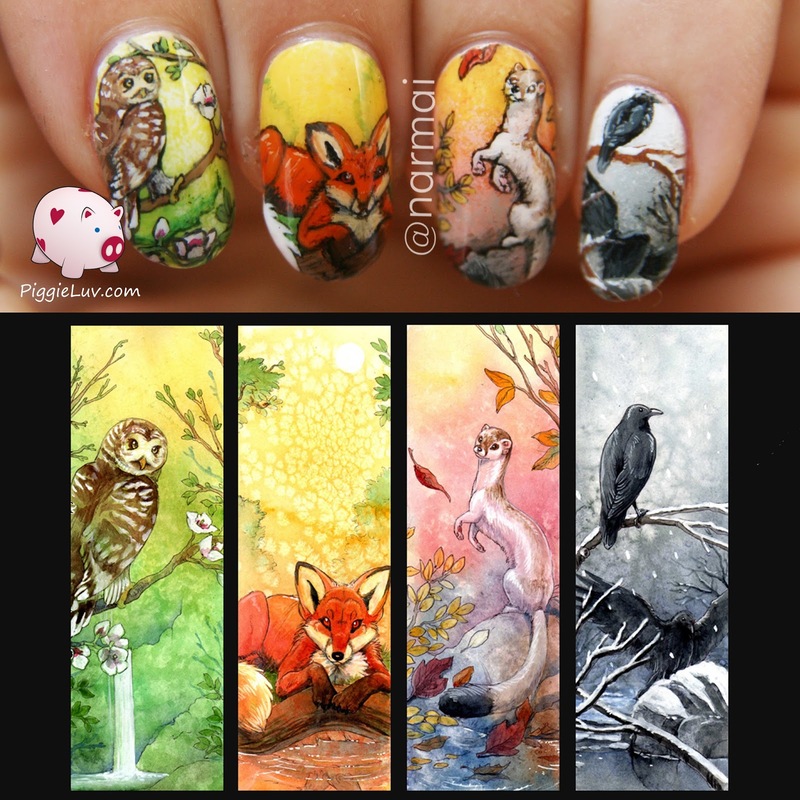 Four nails to paint, and four panels, each with a different season. The original artist is Hillary Luetkemeyer. I think I spent about 2 hours per nail? It stayed fun throughout the painting process, because I got to finish one nail before I moved on to the next, so it paid off quickly and kept me motivated. Ahhh my hell god!!! 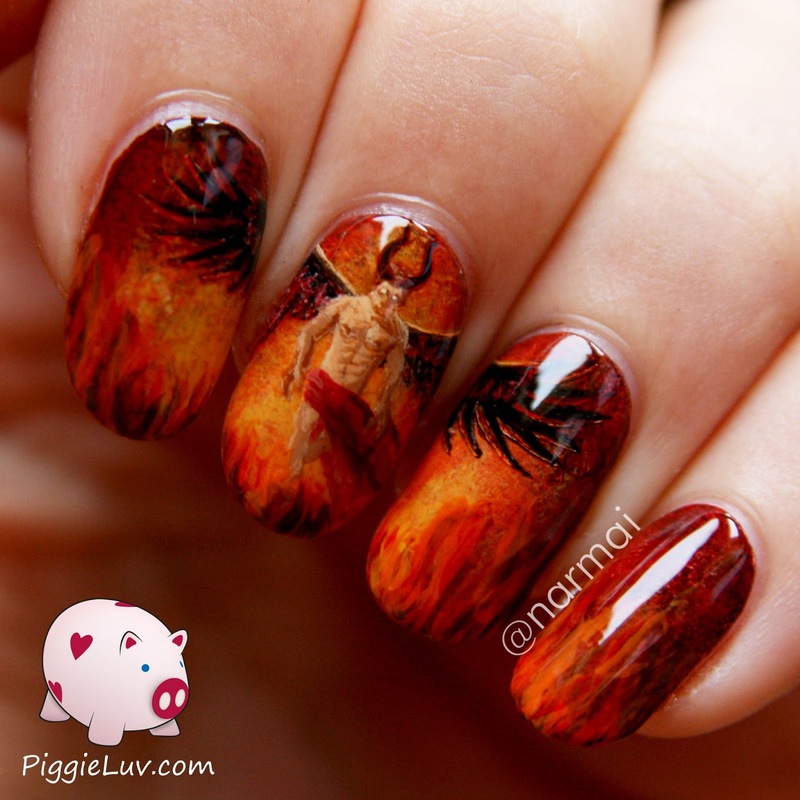 Hotness on a nail! 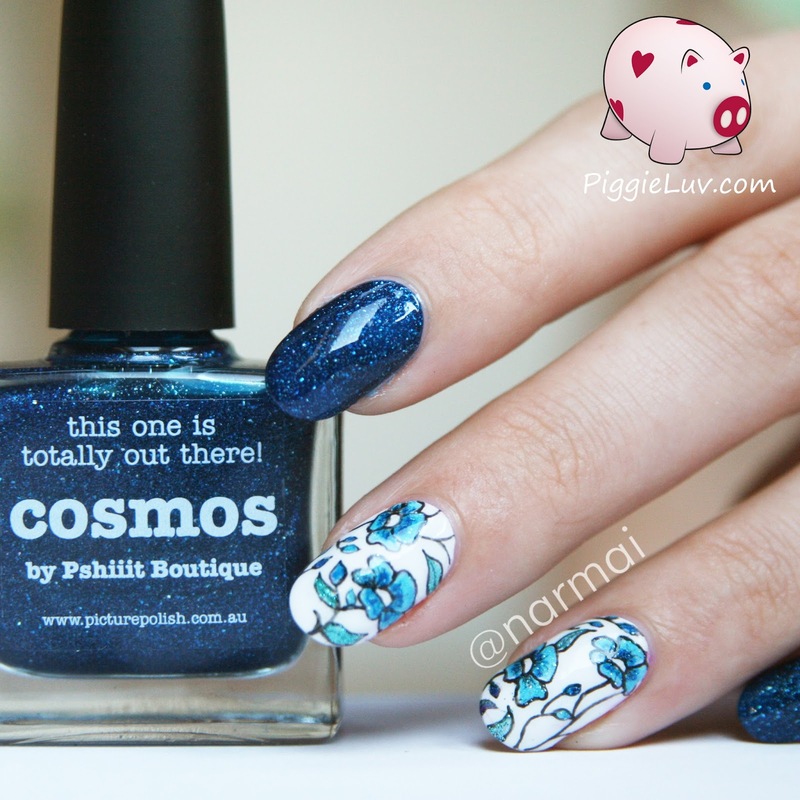 This design actually won me a nail art contest over at Ruby White Tips, my first nail art contest I have ever won! Unfortunately I still haven't received my prize, even though I won in October. Heehee this was my first 3D design! If you've been following me for a while, you'll know that I like to get a little bit crazy and stick stuff to my nails. This was the first in a series of mental designs. 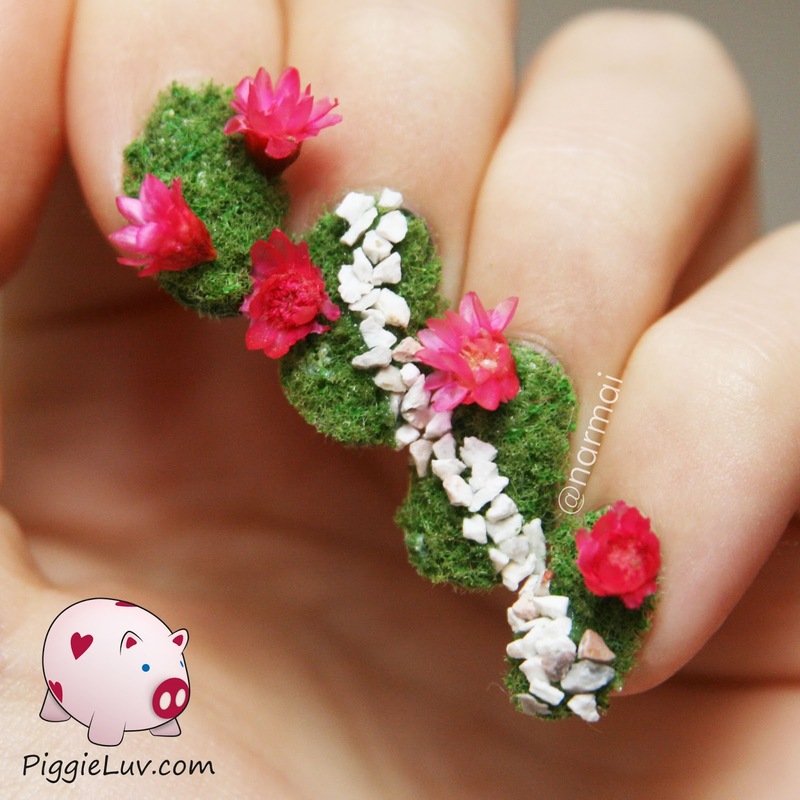 See, I saw these dried flowers laying in the craft room, and I thought how nice they would look on a nail. An idea started to form in my head and this stuff just... popped up! Another art recreation! This original painting by Chuck Pinson is called 'Space For Reflection' and wow guys. 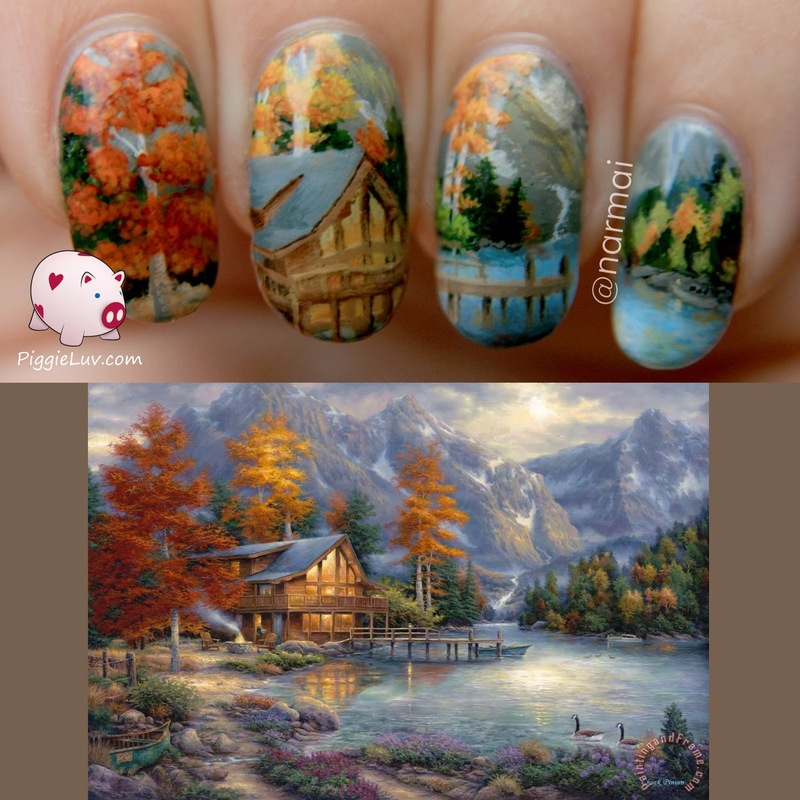 Another 8 hours of my life went into these nails :-p I hated painting those mountains but I loved all the rest. I don't know what it is with me and water, I always seem to need water in my art. It's my favorite part to paint too, you put down some weak strokes and suddenly it looks like something! This little design of mine went crazy on Instagram! It is by far my most liked and commented on photo EVER, not all comments were nice or useful, but so many of them were and lots of them showed their sympathies because I had just lost my grandmother. My grandparents used to make dollhouses together. My grandpa died 4 years ago, he always did the woodworking and he made sure that the little people in the dollhouses had actual electricity. So cute! My grandma made the lampshades, made stuff from Fimo clay and made little tiny clothes. I think I have my 'tiny, tiny, tiny' genes from them! This might seem like an odd choice a midst so many intricate designs, but it gives me a warm fuzzy feeling. Painting the flowers was so easy for me, while I had been struggling for so long to make thin lines look good. It was easy and relaxed and when I didn't like the first color combo I made, I did another one and another one, so I ended up with one design in three different color styles and this was the one I liked best. I kept this on a little longer than usual, just so I could wear it to yoga and show it off. It looked like nail stickers but I loved, LOVED that I painted it myself! I have NO clue how I ever came up with this idea, but I like it! Despite all of the ignorant comments saying 'don't the sticks hurt' and 'I would poke my eye out', most people actually seemed to like these a lot :D Ofcourse I removed the sticks as soon as I was done taking pictures, and I made sure not to try and rub my eyes while wearing it. These experimental designs are only for show, only for the cool pictures. Yaaaaa Halloween was a good time for me! 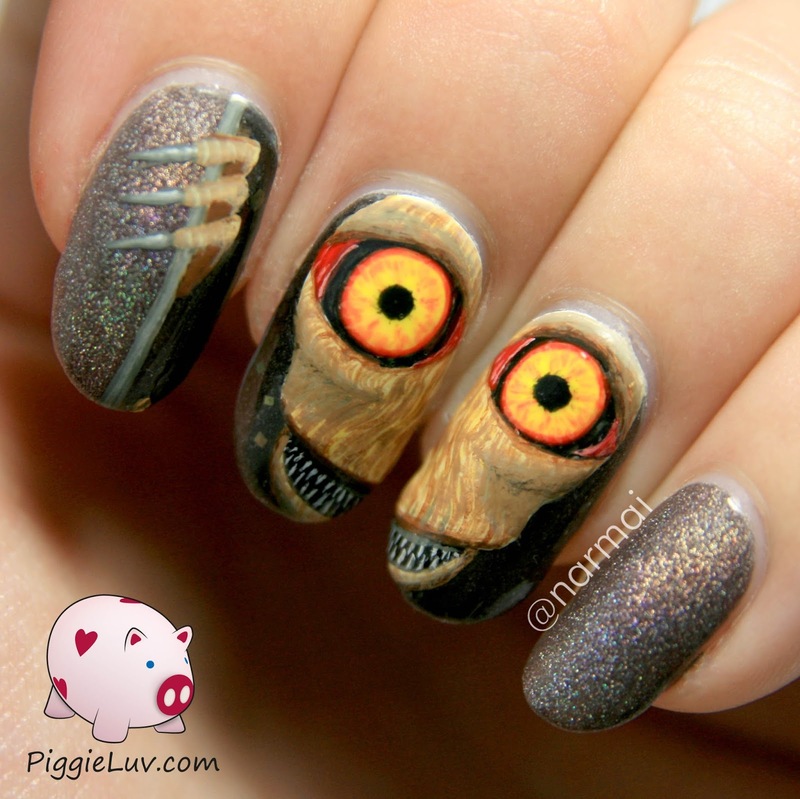 I was really on my nail game and finding creepy things to paint, because I looooove creepy things! This little fella was supposed to be scary, but apparently most people thought he was cute, and your friendly neighborhood closet critter. I myself love how his skin turned out, it's just layer over layer of small lines in different shades. His cheekbones were a challenge but I discovered that it's easy to fake roundness just by painting round lines in the texture. I don't know if that makes any sense? Ahhh my darling Ysera. This is actually a design I saw in a dream, which might sound super weird but I have very detailed dreams, and I dream every night. I probably saw this somewhere, because I have a great memory for images, and that's why I dreamed about it. A friend of mine looked at it and said that she was very much like Ysera from the World Of Warcraft games, so that's what I called her. The dragon from the game is also a dreamwalker, the similarities are creepy and amazing! So, that's them! There's a few I didn't include, like the Epic Love Story, First Snow, Pastel Castle (that won me my second nail art contest!!! ), Fall Leaves, Creepy Shadow, Musical Fairies and my artwork inspired by Tang Yau Hoong. These were all very popular with my friends, fans and followers (and also lots of other people) but they weren't necessarily my own favorites. You will want to check them out though, they're pretty! 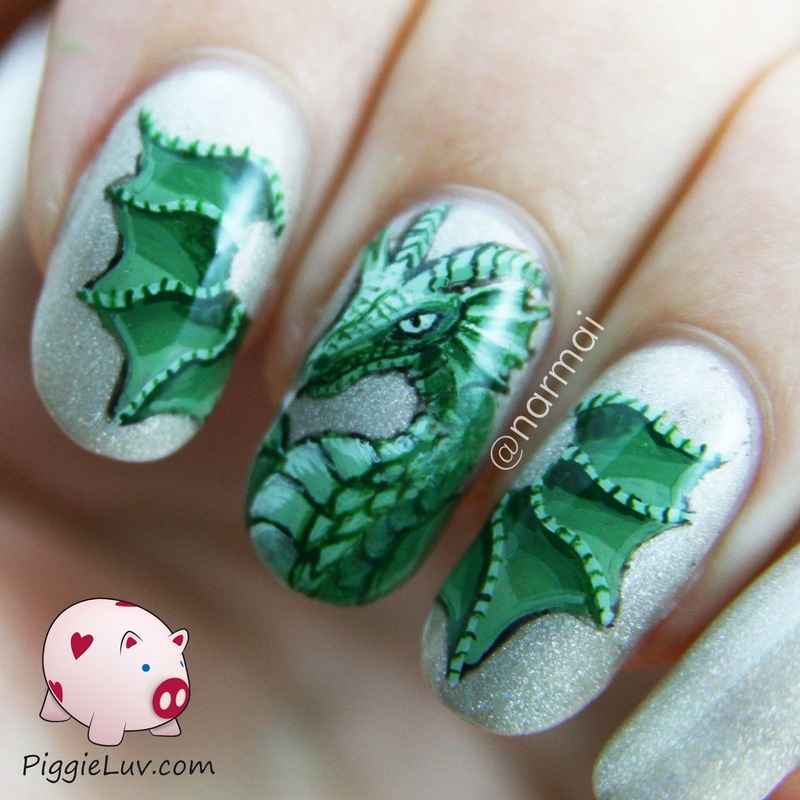 And if you need even MORE of my nail art, you can always check out the Nail Art Gallery tab at the top of my page where I post all of my nail art with links to the blog posts. Thanks for checking it out my dear, dear readers!!! I hope you guys had a great year, and if not, may 2015 bring you better things. Onwards and upwards!!! Glitter jellies nail art with OPI sheer tints!! 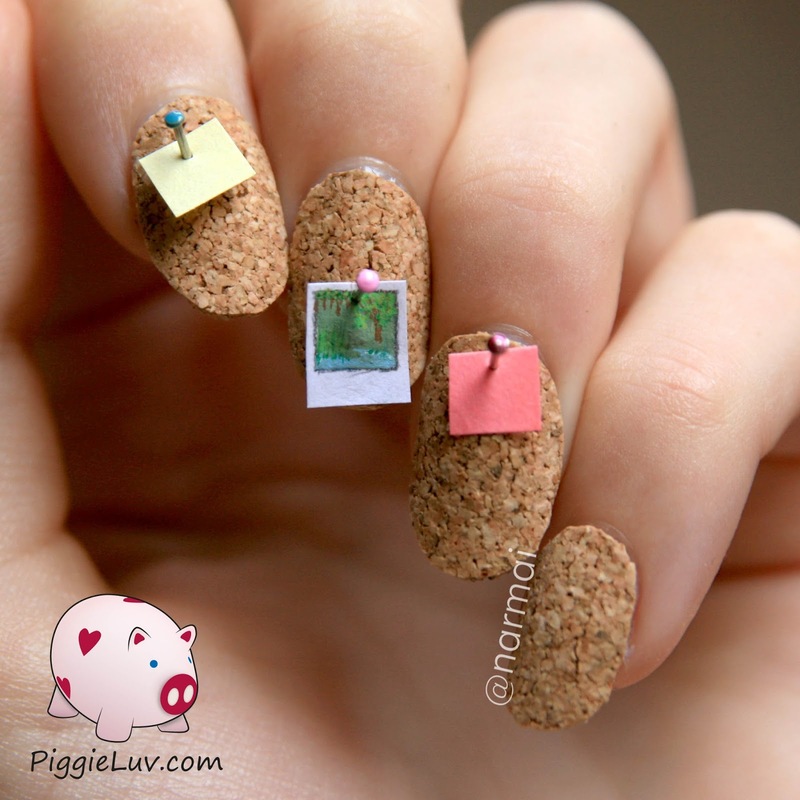 Cork board nail art video tutorial!! !